It comes in worksheet or excel format where you can list the items you want to consider for the wedding and manage the cost accordingly. 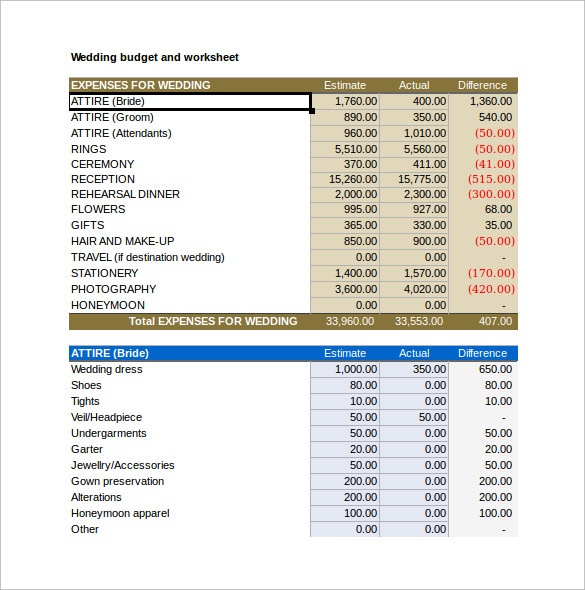 Wedding Budget Calculator Template in PSD or excel format can be used in any program, allowing to specify the amount and percentage for the same. 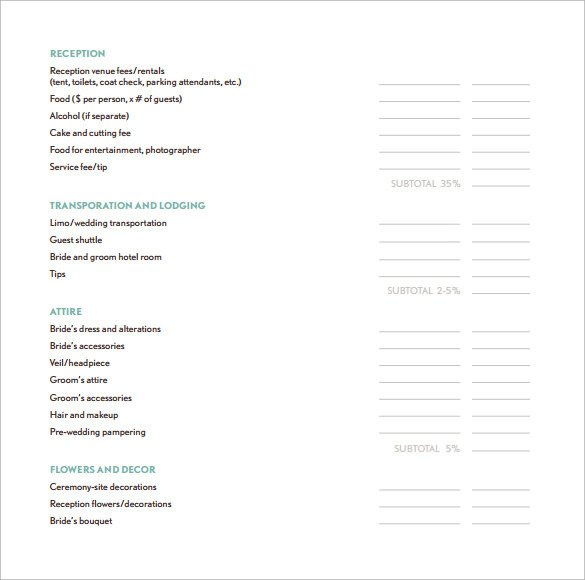 You can list down the checklist and accordingly use for the wedding occasion. The calculator makes the work much easier for the user to allocate the budget accordingly and save the expenses which are not necessary. Wedding budget calculator can be downloaded from online website. 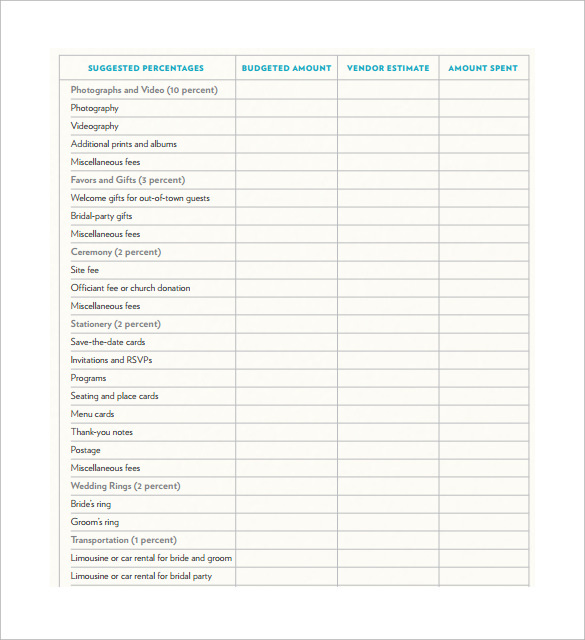 This is very good template for wedding budget calculator. 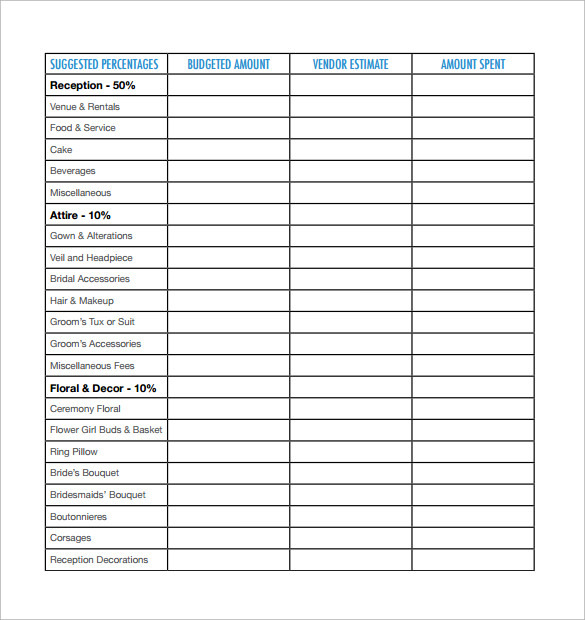 This template will be very helpful while planning a wedding budget. 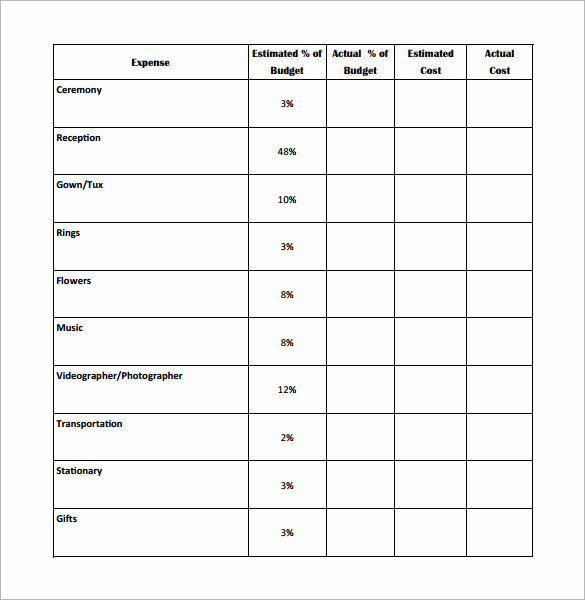 There are separate sections given in this template to make an estimate of different services in the wedding like photography, Music, Stationary and wedding rings. You can put your estimation as well as the actual expense against each service in this template. The template given here is a good template for wedding budget calculation. There are almost all required things and services mentioned in this template and you can easily make budget for your wedding in this template. There are three different sections for pricing which allows you put your estimation, vendor’s rate and the actual spent against each service or product. 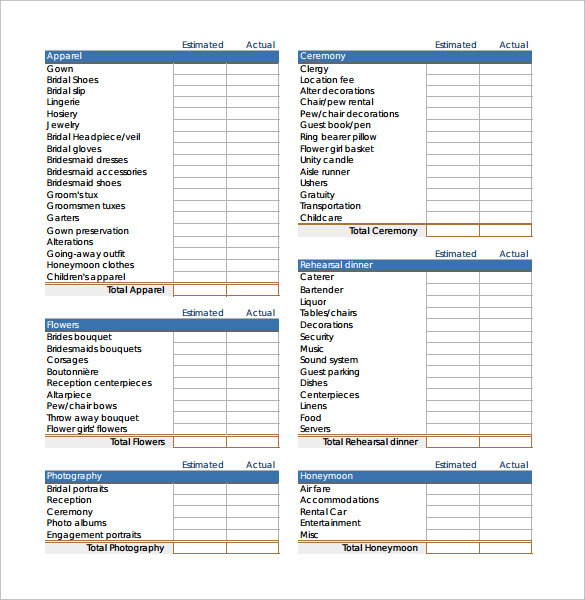 The template given here is designed in excel format, this will help you to calculate the budget easily by just putting simple formulas in excel sheet. 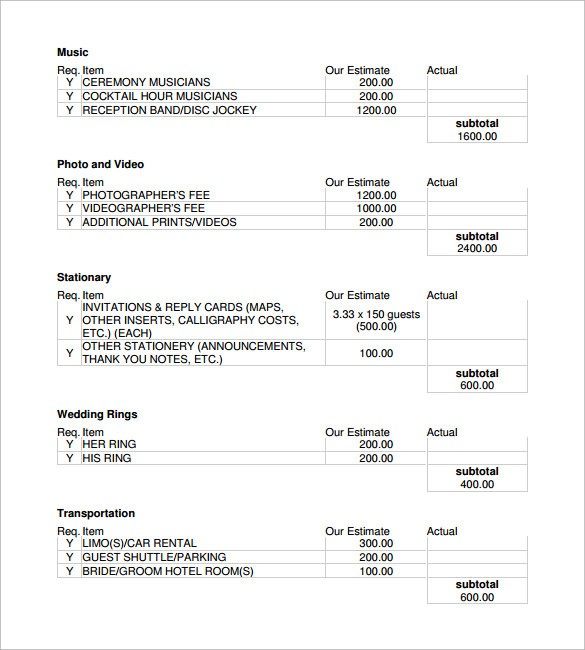 There are different cells for different expenses and you can evaluate the budget spent on the wedding by putting the figure of estimation and actual in this sheet. 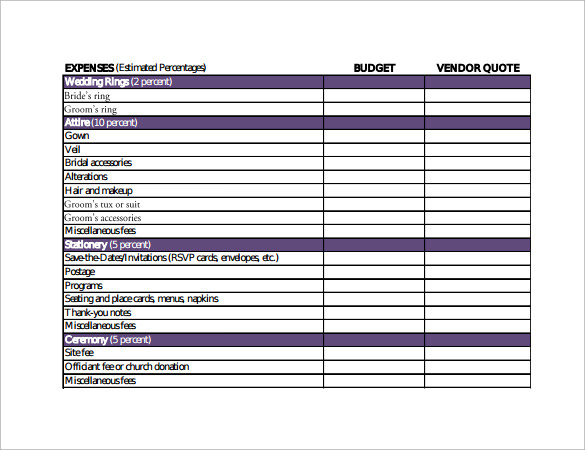 This wedding budget template is designed exclusively for the venue of wedding. This template contains all the required item details like flower, accommodation of guest, transportation, attire etc, which are required at the wedding destination. If you are planning separate budget for destination then it is a very good template for you plan. Why We Need Wedding Budget Planning Template? One must calculate the budget for the wedding carefully in writing and template given here will make this tack easy for you. There are many types of templates given here for wedding planning. From venue to photography and food, you can make a budget for every service of your wedding by the help of these templates. When We Need Wedding Planning Template ? Planning a wedding budget is not an easy task, so you must be very careful while planning the budget for the wedding. These templates are required to calculate the total estimation for the wedding and you can note the actual expense in the same planning template to analyze the wedding budget later. There are many small and big expense occur in wedding, it is advisable to take help from these template while planning you wedding budget. Wedding budget template is also required to make payment to the different vendor post wedding and it is good to plan each expense in single document rather than having multiple bills and plans for different services. How These Wedding Budget Templates Will Help You? 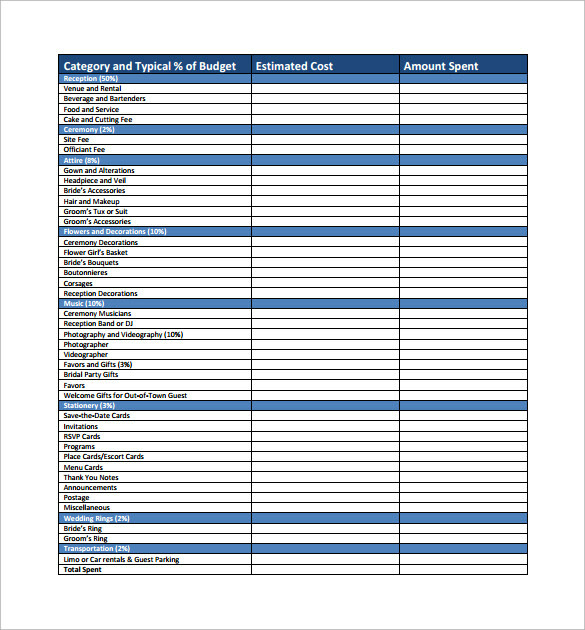 So this template will help you in planning the budget for all the services and products required for the wedding to have a fir idea of budget required for the wedding. When you will have an idea about the budget, then you will be able to plan your expenses effectively and later you can analyze the wedding budget based on estimated and actual money spent. A successful wedding planning required lots of brainstorming and it is tough exercise. Wedding budget planning is very crucial thing because it is the base of all the expenses of the wedding. To calculate the budget of wedding there are many templates given above which you can download and use according to your requirement.